28cm high x 63.5cm wide x 38cm deep, this authentic representation of the Opera House will even stay true to its iconic harbour surrounds with the introduction the LEGO Group’s largest blue stud baseplate ever along with an abundance of dark tan LEGO bricks including the rare 1x1x2/3 stud and 1x2x2/3 stud slopes. There is already an Opera House model as part of the architecture series, but that’s dwarfed by this new model. While it’s all very nice that our iconic buildings are included in the LEGO range, it would be nicer still if the company paid more attention to us as a market rather than creation fodder. The new LEGO set has a US retail price of US$319.99. First there has been no announcement of a price in Australian dollars. Secondly, you can bet that when it comes the Australian price will be disproportionately inflated. Finally there are still no details on an actual release date in Australia (just like with the EV3). Just as a matter of interest I took a look at the price difference between buying the existing Opera House architecture set from the LEGO store as an American customer (for whom it retails at US$39) and as an Australian customer (we pay $59). Apply the same differential to the new set’s US$319.99 retail price and it will be around $480 in Australia. Ridiculous. 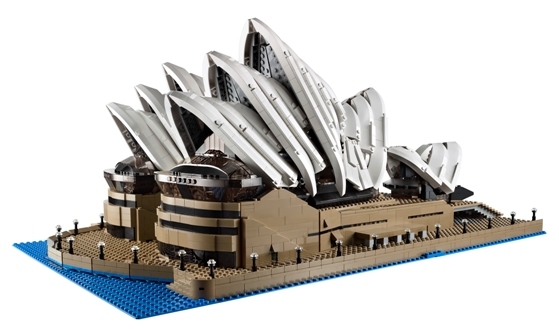 So, LEGO, while seeing the Opera House in bricks is lovely – how about making an effort to do better by your Australian customers? See also: Why LEGO costs more in Australia.